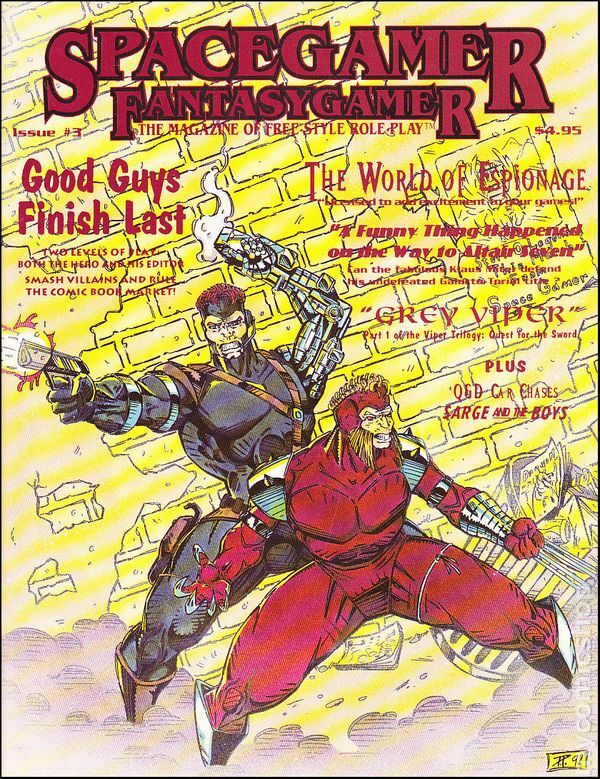 So, desperate as I am to get more of the Conrad's Fantasy/Barony/Free-style Roleplay RPG system, that I have ordered two issues of the defunct Space Gamer Fantasy Gamer. This was not cheap, as I live in Japan, but as far as RPGs as literature I am well pleased with my purchase. Horrid, Rob Liefeld-inspired art. Well, he was pretty popular back then. Even adolescent, wanting to be a comic-book artist young me was tricked into liking Rob, though I was starting to question what the hell was up with his attempts at anatomy. Anyways, the artwork accompanies the comic-book take at the Free-Style RPG system: Good Guys Finish Last. The interesting part is you actually play an entire comic book company. You and the other players control cool heroes too, of course. But the ignobles* and scenarios in this iteration of the system encourages you to pull publishing stunts with your story-lines and character deaths. 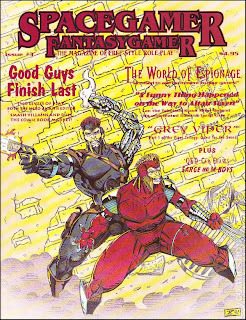 There is a scenario for the GGFL RPG in this issue too. Revolt in the East includes messing with timelines in both the Crisis on Infinite Earths sense and also as a thing imposed by someone who bought the comic company and decided to restructure the lines. It's a bit confusing, but sounds like it could be awesome if one pulls it off. Which gets me thinking; an ambitious GM could make a campaign that reflects the true history of a comic company. Like the possibilities with making the DC universe come together from its disparate companies would be amazing. And super nerdy. The horrible Liefeld aping is over most of the issue, but it is thankfully less obnoxious when it gets to the Barony scenario, which a classic dungeon delve, Grey Viper. There are unique monsters (crazy dead, gem-powered guardians, and waves of rats) and a Quick and Dirty† table for what happens when you fall into a room of vipers. You also get to see mention of the great Delta Zaire of character progression chart notoriety in the fiction that sets up the adventure. I want to run this. The scenario for Era Ten (future iteration of the RPG) seems cool too. Very Aliens-esque space marines in setup, with the tantalizing finale of stealing items you need from your past self. * :Ignobles are the experiences you need to level up in any Free-style system game. †: Quick and Dirty is a term for random tables in the FSRPG systems. They even go as far as to ™ the term.